Our Nobles Leather Arm Bracers feature a simple design with just enough detailing to make them suitable for the upper-class. This bracer is crafted from 7/8 oz. leather that has been cut to a very appealing shape and studded with several domed rivets along the edge. 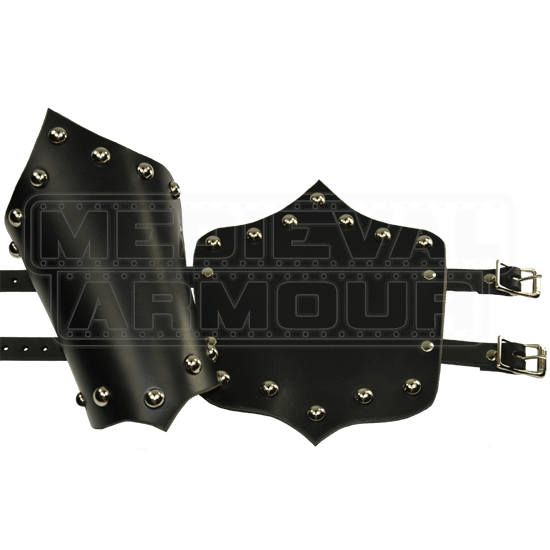 The bracer also features a distinctive shape with sweeping points at the top and bottom that makes for a very attractive look when the bracer is worn about the forearm. And speaking of wearing the bracers, they are easy to put on and comfortable to wear for periods of time, thanks to the pair of leather straps and buckles that are used to secure the bracers to your arms. Despite the word noble in their name, these bracers are great for anyone; they come in a variety of interesting colors and make for a great accessory for anyone who needs a good pair of bracers, whether they are going for a noble look or a commoners look.